ATS Inc. is proud to offer the only FM approved duct available with a StaticSafe™ conductive liner. In addition to the benefits of ATS FXP™, ATS StaticSafe Duct™ offers additional protection against static discharge when exhausting flammable or explosive gases. For part types and dimensions for StaticSafe Duct™, refer to the Mechanical Drawing Guide (Pg. 54) for ATS FXP™. StaticSafe’s™ high corrosion resistance compliments its conductivity to make a product that is desirable for corrosive exhaust applications where there is the potential for venting explosive gases and static dissipation is required. ATS uses a low smoke, fire safe resin to provide a rigid structural shell, which encloses the corrosion resistant conductive liner. ATS Conductive H-Collar™ and ATS Conductive Slip Collar™ with ATS Conductive Putty™ are used for joining duct sections. There is no need for using cumbersome grounding straps or wires across joints! The joints themselves are conductive. The StaticSafe Duct™ system is self-grounding. ATS StaticSafe Duct™ is Factory Mutual FM4922-Approved.Factory Mutual Approvals approves ATS StaticSafe Duct™ to be used for fume and smoke removal in cleanrooms without the need for interrupters or automatic sprinkler protection. 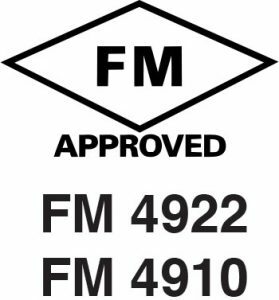 ATS StaticSafe Duct™ is also FM 4910 Approved. It meets FM’s requirements for smoke damage (SDI) and fire propagation (FPI). 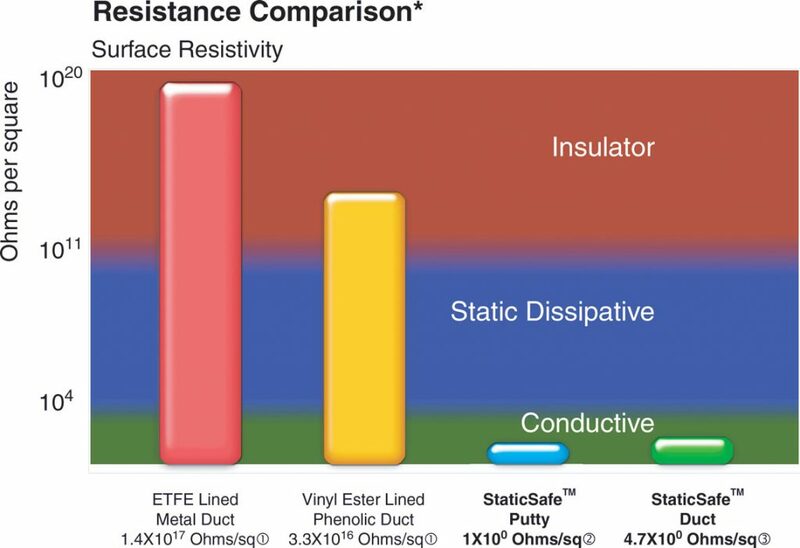 Delsen Test Report – StaticSafe™ has been tested for volume and surface resistivity with a measurement of 0.60 Ohms-cm and 4.7 Ohms per square*, respectively, which exceeds common requirements for conductivity of 1 million Ohms-cm (1×106). Request Delsen test report dated 5/11/01. 1 See Delsen Test Report 05/11/01, pg. 3. 3 See Delsen Test Report 05/31/00, pg. 3. Delsen Test Report – ATS StaticSafe™ has been tested for volume and surface resistivity with a measurement of 0.60 Ohms-cm and 4.7 Ohms per square**, respectively, which exceeds common requirements for conductivity of 1 million Ohms-cm (1×106). * Surface resistivity is expressed in ohms per square, without reference to the size of the square. The ESD Association Glossary, ESD-ADV 1.0-1994 (1), describes Surface Resistivity in the following way: “For an electric current flowing across a surface, the ratio of DC voltage drop per unit length to the surface current per width. In effect, the surface resistivity is the resistance between two opposite sides of a square and is independent of the size of the square or its dimensional units. ** Resistance (ohms) is the property of a substance to resist the flow of electrical current.